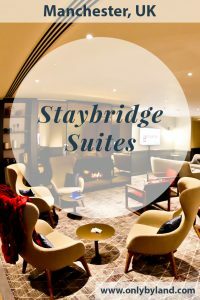 For the best rates, visit the Staybridge Suites Manchester website. To view the latest events and pictures, visit the hotels Facebook and Instagram feeds. The hotel is located on floors 12-18 of a double decker building shared with partner IHG hotel, Crowne Plaza. As a matter of fact, the hotel has excellent aerial views of the University campus as well as Manchester city center. As a result it’s perfect for parents coming to visit their kids who study in Manchester. If you wish to visit Old Trafford, the Etihad Stadium or Media City, the tram station is a short walk from the hotel. Manchester city center is a 15 minute walk from the hotel. You’ll receive a warm welcome to the hotel at check in. The friendly staff are there to make sure you have a wonderful stay. Remember, Staybridge Suites Manchester is your home away from home. 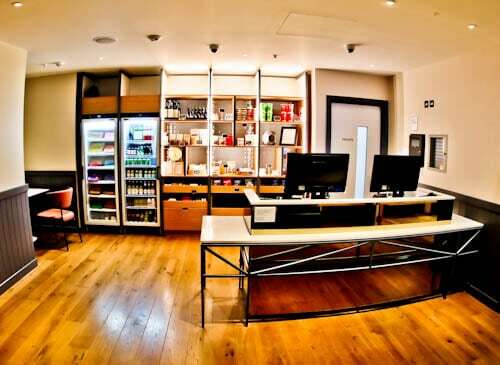 Whether you’re visiting short term for leisure or long term on business, the staff are there to ensure you make the most of your time in Manchester. Some evenings, guests are invited to a social hour with complimentary drinks and snacks so make sure you ask about this. Adjacent to check in is the pantry. Here you can buy useful items to cook in your room as well as snacks. Additionally, there is washing powder on sale here which is useful if you visit the complimentary laundry facility. If you do require something else, there are several supermarkets a short walk from the hotel including a Tesco and Sainsburys. As you would expect at Staybridge Suites, the rooms are cosy yet spacious. 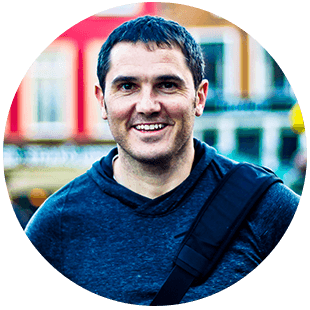 WiFi has a strong signal, is fast as well as reliable. Each room has a flat screen TV with several TV and radio channels. Importantly, there is a fully equipped kitchen with all required amenities. Alternatively, there are one bedroom suites available. These are perfect for extended stay guests visiting on business. With the additional room, you can keep it separate for your work. As a result, the bedroom is reserved for pure relaxation. The bathrooms are also clean and spacious and come with all required amenities. It’s especially useful that the shampoo and shower gel come in large bottles so you’ll never run out!! Hair Dryer; yes. Iron; yes. 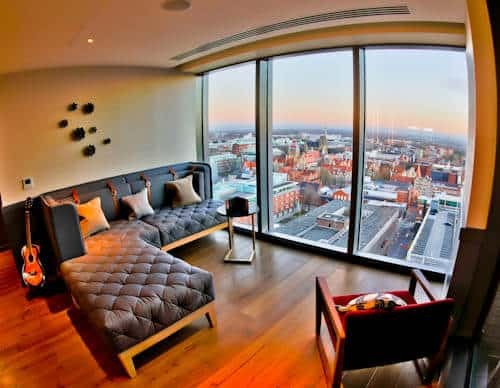 Whether you choose a one bedroom suite or a studio, the views over Manchester are unbeatable. One side is the city of Manchester, the other is Manchester University which is a historic Harry Potter esque style building. The views from both sides of the hotel are equally as beautiful. 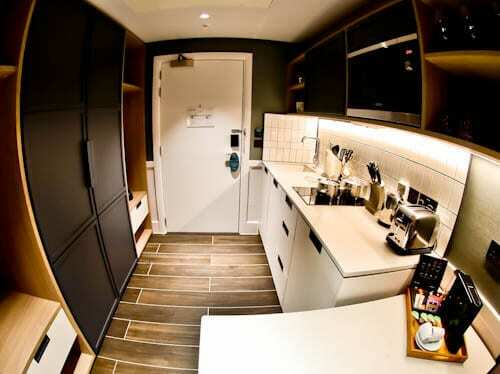 For many guests, the fully equipped kitchen is the reason they choose this Manchester hotel. A fully equipped kitchen is essential if you’re with kids or have strict dietary requirements. Vegans, vegetarians and those on gluten free diets will benefit from the kitchen. You may just be eating healthy and controlling your kitchen is the best way to achieve this. A few nights per week, guests are invited to attend the social hour. During social hour you may enjoy complimentary snacks and drinks. Not only can you choose from a selection of complimentary alcoholic drinks but there’s also a friendly member of staff to pour them for you. Social hour is great for meeting fellow hotel guests, essential for those staying long term in Manchester. 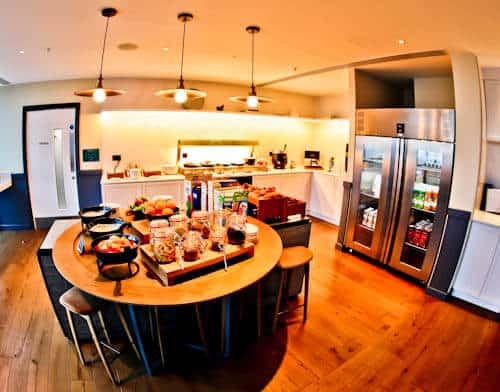 Each morning, all guests are invited to enjoy a complimentary breakfast. The breakfast continues the homely feel of the hotel. Where else can you grab a carton of fresh orange juice from the fridge other than home? I recommend the chocolate muffins, they’re delicious! 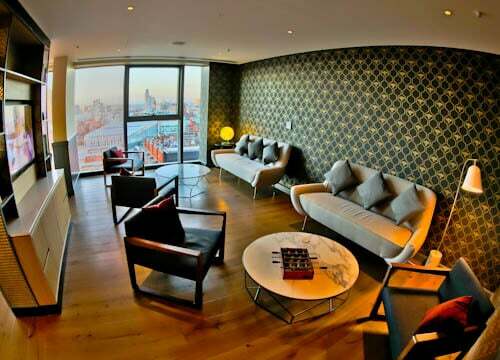 Whilst you feast on the buffet breakfast you can enjoy 18th floor panoramic views over Manchester. 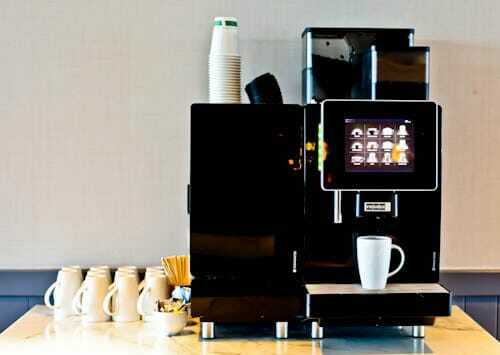 It goes without saying that a major part of the complimentary breakfast is the tea and coffee machine. The good news is that this machine is available 24 hours a day. There are paper cups available so you can prepare a coffee to go as you head out into Manchester. If you’re arriving jetlagged from another country and require a coffee at an unusual hour, this machine will be your saviour! The 18th floor lounge is where you enjoy the buffet breakfast as well as the evening social hour. Additionally, you may want to chill out here in the afternoon and enjoy a complimentary coffee. It’s a homely lounge which features comfy sofas around a fireplace. Did I mention the panoramic views over Manchester? If you’re in Manchester on business, you may require a quiet area to hold a meeting. 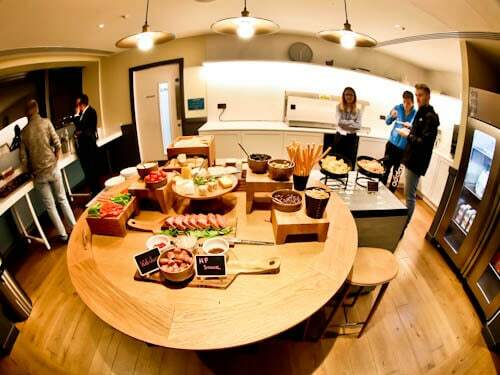 The Den is designed exactly for this, it’s a relaxed meeting room with panoramic views over Manchester. Most importantly, the complimentary coffee machine is not far away. In addition, this area can be useful if you are traveling with kids and want a seperate area for them to play in. 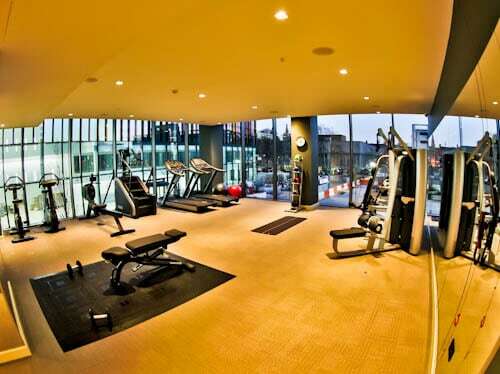 All guests have complimentary access to the 24 hour fitness center. It’s possible to perform any type of workout here. It’s spacious so you can perform yoga or stretching. Secondly, you could make use of the dumbbells or weights machine. Finally, you could make use of any of the wide selection of cardio machines. The fitness center is located on the first floor so how about finishing off your workout by taking the stairs back up to your room on floors 12-18? 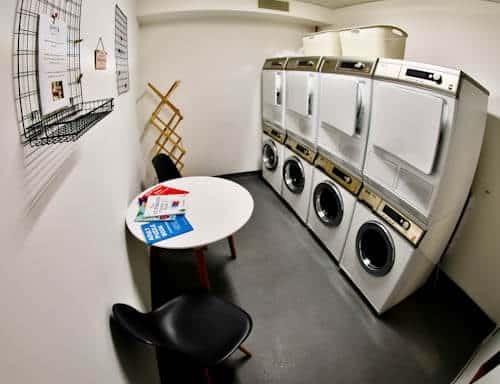 At Staybridge Suites Hotel Manchester, you have access to a complimentary laundry facility. 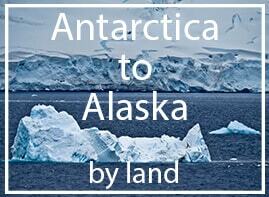 This facility is always available and it’s super convenient for extended stay guests. Detergent can be bought from the pantry behind reception. If only every hotel offered a complimentary laundry facility! Guest lockers are incredibly useful for extended stay guests. Maybe you’re leaving Manchester for a while but plan to return. Maybe you’re visiting Staybridge Suites Liverpool, Staybridge Suites Newcastle or Staybridge Suites Vauxhall. 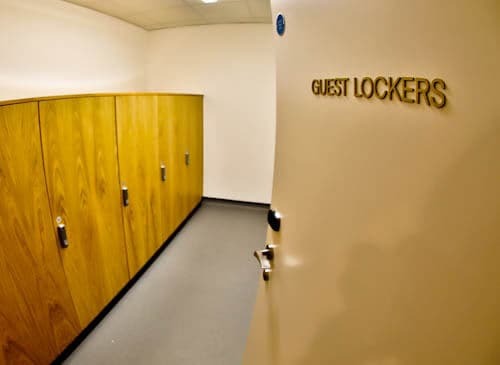 There’s no need to take all your luggage with you, you can take advantage of the complimentary guest lockers. 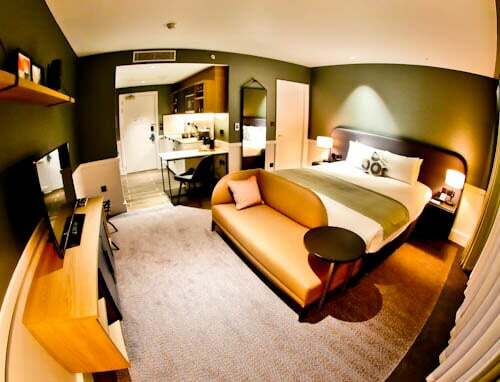 Staybridge Suites Manchester is a double decker hotel shared with Crowne Plaza Manchester Oxford Road. For this reason, you can take advantage of the Laureate restaurant located on the ground floor. For guests of the Staybridge Suites who fancy going for a meal out, the Laureate is perfect. 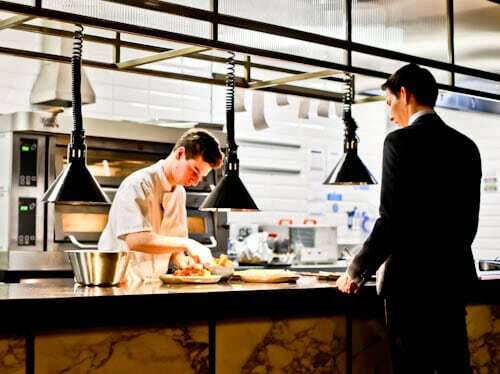 Staff can show you the menu and also book you a table. Bon appetit. Be sure to take advantage of all the hotels excellent facilities. For me, the incredible views over Manchester from the lounge whilst enjoying a coffee were amazing. 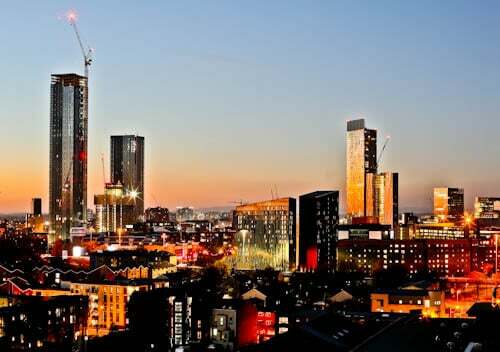 A sunset over the Manchester skyline can be majestic, even more so during the social hour! 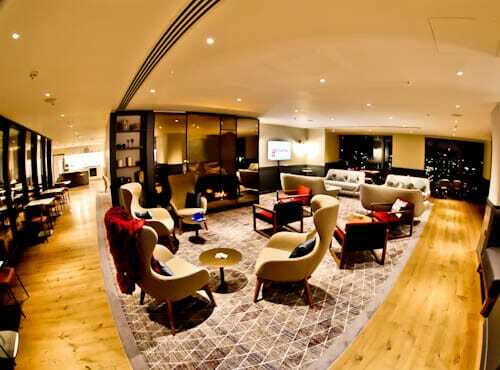 Visit the Staybridge Suites Liverpool, Staybridge Suites Newcastle and of course London at Staybridge Suites Vauxhall.